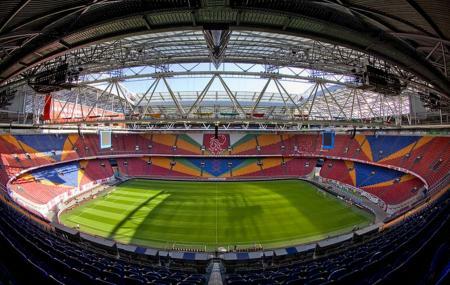 Amsterdam Arena is one of the biggest arenas in the destination and is known and known well for its picturesque setting and great views. The destination is a must visit if you are one who loves sports. The arena was built between 1993 and 1996 and has been in the limelight ever since. The arena opened its doors to the general public on 14 August 1996. An astonishing 140 million euros were used up in developing the arena to what it is today. Tickets depend and can be known locally. Timings depend and can be known locally. Take a bus from Amsterdam, De Entree. Amsterdam BijlmerArenA subway station is just across and you can take a ride from there. How popular is Amsterdam Arena? People normally club together Oude Kerk and Hermitage Amsterdam while planning their visit to Amsterdam Arena. Excellent place to go to kill a few hours. The stadium is fantastic as is the stadium museum. You could lose an hour or so easily reading and looking at the glittering history of the Netherlands biggest club. The VR demonstration of the stadium different uses is brilliant. I had no idea that it could transform into a spectacular indoor venue and back to football all within a couple of days, impressive! I would highly recommend this to anyone who has a genuine interest in football history. Ajax is certainly one to visit and tick off the 'list'. Home of the Ajax football club, this arena offers a intimate experience for watching football matches or any other event being hosted. Regardless of where you are sitting you have great views from all areas of the arena. Conveniently located a short walk from the metro station reaching the arena is very easy. The arena also offers tours which give you great you a unique perspective into the arena and you also get access to area's not normally open to the public during events. Great football stadium with closed roof to save the pitch from showers and snow and it absolutely resulted into one of the best pitch. Day before match it was snowing and on the day of match maximum pathways were clear. Staff on the way were helpful. Crowd absolutely enthusiastic. Enthusiastic away fans made it great rivalry. Thanks to Ajax players for scoring goals at my end and enjoying those goals and missed chances was stunning. Ajax F side made the difference in my first visit to European football. This stadium is awesome! For all the girlfriends and boyfriends being dragged here by their football loving partners/friends, this is a cool Stadium. Feels way bigger than 55,000.